I had been looking for Opium Venture for a while, as the last nugget in the mine from Gerald Sparrow's memoirs from Thailand. I found it the other weekend for 30p at an honesty bookshop at Claydon House. It is as fantastic as I remember the first book I read by him: The Star Sapphires. In both cases truth is more amazing than fiction (and I think I can assume it really is truth, unlike Life of Pi -- that or Mr. Sparrow's fiction all seems to be about the same events). 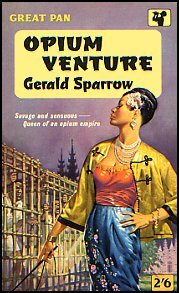 In Opium Venture, Sparrow is 28 and newly appointed as a British legal advisor, but the book was written many years later when he had retired to England, and the Salem Princess was dead. He was sent to Chiengmai with the consent of the king, because a foreigner had recently died mysteriously while prosecuting the opium trade too fiercely. Sparrow learns that the Salem Princess controls most of the drug trade from the Shan States north of the border. He imprisons her brother, but is not killed because the court decides to imprison and then deport the brother and his men -- after the men have worked on Sparrow's orchid garden! Sparrow makes love to the beautiful and well-traveled daughter of a local official in the meantime. Then he receives a bribe and an invitation. He returns the bribe with a polite note, but does later make the 15-day journey north, with an elephant, to visit the Salem Princess. He stays at her palace, goes riding with her to see the vast poppy fields in bloom, sees how she addicts and subverts British officials and tortures her staff who slip up or betray her. From this she derives sexual excitement. He tries the opium himself, and wonders why he was invited. Then he learns: she needs a partner to run the drug business. Would he like the palace, millions of dollars, and her? He accepts the last part of the offer with alacrity. But it wouldn't be British to be a drug baron - what would his mother say? I'll omit what happens at the crisis, because you may actually want to find this one and have a read, if you like a real-life James Bond. But the king does knight him in the end. Not my edition, but on the paperback cover you can see the cages where the princess kept her transgressors. We went to Claydon House because P hates us staying home, inside all weekend. It has a fine restaurant for lunch, and was where Florence Nightingale lived. For some reason, it has a lovely gamelan set. Tim wrote: Place coins here to contribute to cat's food bills -- The title of your novel about life in England?